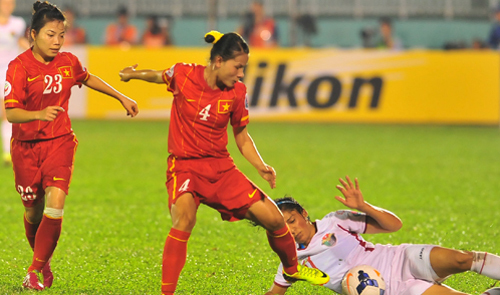 The Vietnamese national women’s football team were today defeated 4-0 by Japan in group A of the AFC Women’s Asian Cup held from May 14 to 25 in Ho Chi Minh City. Japan opened the score in the 44th minute from left corner kick. Nahomi Kawasumi received the ball, sped up, and blasted a shot to send the ball flying straightly into the net of Vietnamese goalkeeper Kieu Trinh. Before, Vietnamese keeper Kieu Trinh made outstanding performance when helped stop several chances by Japanese strikers Yuki Ogimi in the 38th minute and Aya Miyama in the 24th minute. At the 64th minute, Azusa Iwa Shimizu headed the ball only to bounce at the cross bar. The ball came to Nanase Kiryu who cushioned home the second goal for Japan. Three minutes later, from a high pass from the right wing, Japanese striker Yuki Ogimi jumped up and headed home a goal to take Japan to the 3-0 lead. At the 85th minute, Nahomi Kawasumi extended the gap to 4-0 for Japan. In the previous match on Wednesday, hosts Vietnam defeated Jordan 3-1.